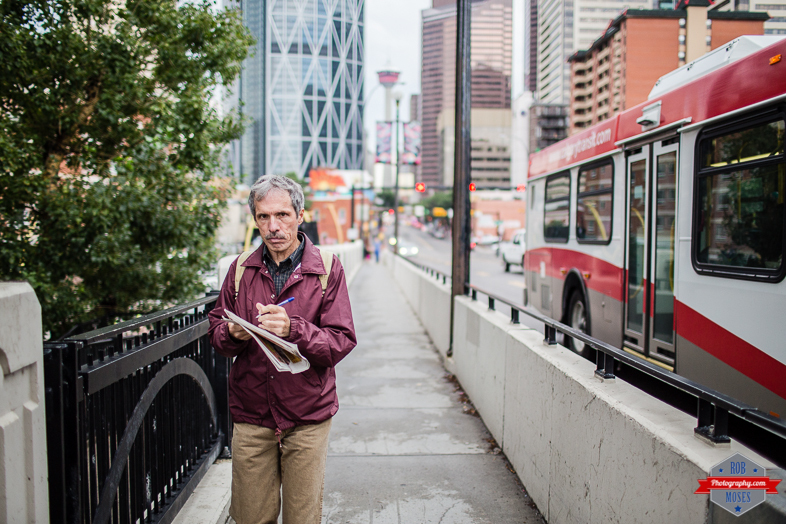 This entry was posted in Cities, People, Street Photography and tagged 35L, 35mm, 6D, Alberta, beautiful, blur, Bokeh, bow, bridge, building, buildings, bus, Calgary, Calgary Tower, Canada, Canon, city, City Life, condos, confused, crossword, dude, face, guy, life, man, metro, newspaper, pedestrian, pen, photo, Photographer, Photography, prime, puzzle, Skyline, skyscrapers, stoked, street, street photography, talent, tower, Urban, walk, walking, yyc. Bookmark the permalink. Has anyone ever gotten upset with you when you snap their picture Rob? I love the picture by the way! He looks like a very happy crossworder . . .
Haha yes who knew ;). Thanks about the picture. I have just started taking street shots of people. I have always felt a little uncomfortable doing it. But I think I am starting to get the hang of it. Hey that’s great! It is super fun 🙂 Once you get that one shot your after, such a good feeling! Have fun out there ;). Ha! This is a great shot! And the Calgary Tower artfully framed by tall buildings…. I’ve done stuff like this. The walking crosswords or the picture taking? haha. Odd times I do street photography I shoot “from the hip’ so to speak to avoid reactions. Having a DSLR hanging round my neck and using a more compact from lower down really fools ’em. Nobody notices. People watching is fun. People watching with a camera is better because you permanently capture the moment. I think I got lost??? You have three sites…just looked at them all! 🙂 this is great, I’m terrible at taking photos of people…I think it makes me nervous because I don’t know the laws of taking photos of people in public without their permission…do you Rob, can you suggest some reading on the subject? Read Shmeed, just take their pictures haha. If some one has a problem with it, they will let you know :). In all the years I have been doing this only one person has ever said anything to me and of all people it was another photographer haha. He just asked I don’t put it on Facebook. lol…I’m not confident enough for that…but I guess as long as I’m not trying to make money from it and it is in a public location it is fair game? Is that how you see it? I put the majority of my photos on Facebook as I take them for our local Farmers’ Market…I’ve been taking the photos at the Market for two years and I’ve not had anyone ask me not to take the photo…some have moved or turned their heads but to be honest when I take my photos it is to show how busy the Market is and not to center people out…at least for the most part. LOL totally hey! Do it up Jesse! You’ll love it 😃.